Underscoring is the music underneath all of the dialogue and action on the screen. It does not stand out on its own; it is fairly unobtrusive and may unconsciously go unnoticed, even as it helps shape the tone of the scene. When creating an underscore, the volume is pivotal to creating its effect. During a scene of heavy action, for example, the volume may be raised to create a sense of urgency. During emotional moments, the underscore may be played softly behind the dialogue. The music typically needs to be not distracting, so underscores are not usually very catchy or jarring. The music tends to be instrumental, without any spoken words, so as not to disrupt the dialogue and action on screen. String instruments, such as the violin or cello, are commonly used for underscores as they can be played softly, without interrupting the rest of the scene. Composers of underscores are typically brought in towards the end of a project after the show or movie has been filmed and edited. The composer views a rough cut of the film and talks with the director about what is needed in terms of tone and style. Then, the composer goes back and makes notes on each scene, including the cue times, transitions and key dramatic moments. This process is known as "spotting." With those notes, the person in charge of underscoring will write the necessary music, determining different sounds for different scenes. They then work with an orchestra or band to record the music. This is often done with the orchestra performing in front of a large screen playing the film, so the composer and director can see how the music syncs with the film and its tone. Afterward, the composer works with sound engineers and editors to digitally alter the music files as needed so they can play softly in the background. This is an intensive process that plays a pivotal role in a film's development. 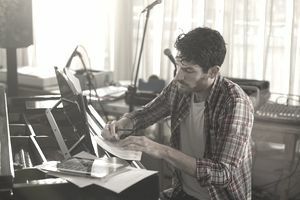 In some rare cases, the director will ask a composer to begin the score before filming, and the story will be edited to fit the music, rather than the other way around. This is more common in heavy dramas, where the music plays an essential role in portraying the emotions onscreen. When done well, underscores are not typically noticed, but they help complement and deepen the intensity of scenes. When done poorly, they can completely wreck the moment. Music that is too loud or too fast can make a love scene unintentionally funny, and music that is too slow or soft can make an action sequence boring. While an underscore is instrumental and is designed to complement the story, the soundtrack usually contains other songs than the score. These songs typically are louder or more jarring and often contain lyrics. They are meant to stand alone, while underscores are part of the movie or show as a whole.